Daniela Volpari – another artist I didn’t know about prior to this show. Of course I had to look for one from Italy. She has adorable illustrations of cats and dogs (the theme of her book). The project was conceived by and is sponsored by the Art House Coop in Brooklyn. After the tour, all sketchbooks will enter into the permanent collection of The Brooklyn Art Library, where they will be cataloged and available for the public to view. 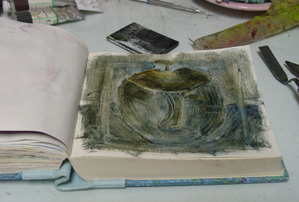 So if you can’t see the show, you can always visit the sketchbooks in Brooklyn. I just missed the deadline to participate in this project – I’m going to try and not let the next one slip by. 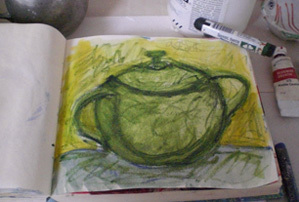 In the meantime, I’ve pulled out my giant sugar-bowl sketchbook and spent time filling a few pages today (photos at left). About a year ago I pulled this big fat sketchbook off the shelf. It had been a birthday present from a friend many moons ago. 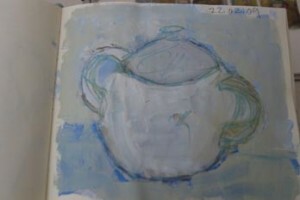 What better way to use it than to see if I could sustain an exploration of one object from start to finish. I’m a year into the project; the book is getting fatter by the month – but not nearly complete. I’m tellin’ you this is one big giant fat sketchbook. 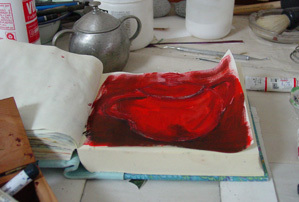 The paper isn’t very forgiving – especially the way I work with it. This is a drawing I did in the book a little over a year ago. This sugar bowl has so much personality – it reminds me a lot of my mother for some reason. Maybe just because it was hers, and she relished this whole pewter tea set which now lives in my home and studio.